Deepwater luxury home with opportunities for dolphin watching, and boating. Take a lunch or dinner cruise from your private dock with lift on the Colleton River to Hilton Head, Savannah, Beaufort and the Intracoastal. This elegant home has to be seen to be appreciated. Gourmet kitchen with custom cabinetry, dbl Wolf ovens, Sub-zero refrigerator, vaulted ceiling of grid beams w/tin inserts, & granite counters. Elevator access from the garage to any floor. Brazilian chestnut flrs, custom woodworking, bull nose corners, lead coated copper roof, high ceilings are just a few of the fine touches.Close to Chechessee Creek & Spring Island Golf Clubs. Simply among the best views and locations within Callawassie Island! 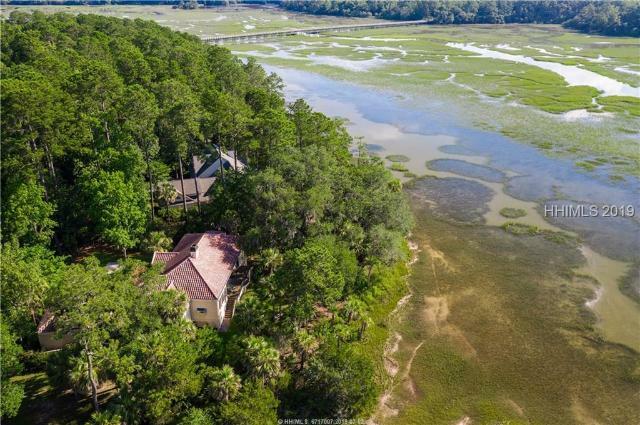 This opportunity provides incredible private Deep Water views of the Colleton River. Located at the very end of a cul-de-sac and privately setback among the Live Oaks and mature landscaping. This classic Lowcountry designed home on almost 1 acre provides comfort and style. Enjoy the full natural light from the rear southwest exposure in your screen porch and deck. 4BR/4.5 BA, Gourmet kitchen, custom cabinetry, center island and gas cooktop. Master Bedroom has extraordinary views of the Colleton River. Detached garage, with covered walkway, has a Guest Suite with full bath. Truly one of a kind home w/marsh front location, short boat dock and private golf front views! Incredible 2017 renovations, too many to list. Highlights: New Gourmet expanded Kitchen with a dream list of extras, top of the line appliances by Wolf and Sub-Zero, 54" Wolf Six Burner, griddle top, with two stoves. 10 ft. Granite top Kitchen Island, accommodates 4 seats, new custom cabinets, new hardwood flooring entire 1st floor, all interior walls and ceilings painted, completely remodeled Master Bath- walls,ceiling, plumbing, electric, custom rain bath shower, separate full spa tub, FR fireplace renovated with matching granite hearth. Must See! Custom 2014 home built by Jeffcoat builders-the best quality! Relax on the two oversized porches making indoor & outdoor living ideal with a Bed Swing & Hot Tub. On almost 1 acre this home is private yet part of the Callawassie Island community. Move-in Ready as you enter the Comfortable Open Floor Plan with Heart of Pine Floors & 10 ft ceilings, built in shelving & fireplace. The Gourmet, Eat-In, Kitchen is fabulous with a Gas AGA stove/oven plus more! Perfect home for entertaining your family & friends. The Master is on the Main and 3 additional bedrooms & baths are up, Storage is Plentiful, This custom home is a must see! This home offers the rare opportunity to build a private dock; DHEC dock permit expires 2022. Situated on a peninsula, this home offers long tidal, marsh and water views from every room. Located on a private cup-de-sac, this custom home offers living at its finest.Enjoy generous ceilings, extensive moldings plus extensive decking and screen porch.Callawassie Island offers true island living along with two clubhouses, 2 pools, 4 community docks, 24 security, and with 27 holes of Tom Fazio golf, Har-Tru tennis courts and a 24 hour Fitness facility. Come enjoy Callawassie Island, which many consider to have the best location in Beaufort County. Sophisticated elegance defines this beautiful custom home. Aesthetically & thoughtfully designed for function, luxury living & entertaining! The open floor plan, expansive Carolina Room, & patio are all designed for enjoying lagoon & golf views & natural beauty. This 4 bedroom, 3&1/2 bath home features a large master & en suite with double vanity, snail shower (ADA accessible), & large walk-in closet. There is a second master bedroom & en suite. The kitchen has a custom island shaped like a piano with ample storage & style, & a duel fuel range & new 4 door Samsung refrigerator. The marble fireplace was imported from China. AMAZING! Great possibilities with this SHORT SALE custom home located on an upscale deep water lot with a dock in this gorgeous golf community of Callawassie Island!. Renovated Kitchen and Baths. 3 bedrooms plus a Bonus Room/Loft/4th optional bedroom with 2 large skylights, 3 1/2 baths, tall ceilings, arched windows, large Great Room with beautiful stone fireplace, many doors exiting to the Trex deck, wine refrigerator, whole house stereo system, wood floors, large laundry & mud room, 2 AC Trane systems & much more. The Master Suite is on the main floor with a sitting area, plus bath with shower & separate tub & a whole-wall cabinet area. Kitchen has been all renovated with Granite counters, new appliances, 5-gas burner cook-top, 2 wall ovens & roll-out shelving, new cabinets & huge island with Granite. Many storage closets & cabinets in this home! Within close walking distance to community pool. Somebody is going to get a great buy on this deep water location with deep water dock! Traditional cedar and brick, lowcountry home on secluded Tabby Point Lane surrounded by the marsh. Enjoy 200 feet of unobstructed waterfront views across 1.8 miles of saltwater marsh, PadgetGÇÖs Island and the Colleton River. From most rooms you can watch eagles soar, osprey and egrets fish, and dolphins corner their prey in the nearby channels. Inside, the flexible floor plan includes an open kitchen with large island, fireplace in the living room, individual his and hers offices, craft room, bunk room for the grandkids and a separate master suite with large bath, closet, laundry, and a sitting area with a private garden and marsh views. Casual first-floor living with mother-in-law suite and office upstairs. Open floor plan that provides both golf and water views of a lagoon, make this a Lowcountry dream. Gourmet kitchen w/6 burner range, custom cabinets, double convection ovens and warming drawer. Zoned heating & cooling enable one-floor daily living with energy efficiency. Sunroom, great room, master bedroom, screened porch, and deck all access to the amazing view, allowing for exciting wildlife watching. Close proximity to Hilton Head, Bluffton, & Beaufort. Gorgeous custom built 4-bedroom, 3.5 bath home situated on a beautiful -+ acre with woods and lagoon and Tom Fazio golf course views! Wonderful floor plan with gleaming Cherrywood floors, tray ceilings, & high end finished throughout. Chefs gourmet kitchen with natural cherry cabinets, granite countertops, and lots of storage. Owners suite with sitting area and large bathroom on the 1st floor. Huge bonus room/4th bedroom upstairs with bathroom. Covered screened lanai to enjoy the views and weather. Extremely well built and maintained home. Lots of storage in this home! Wonderfully conditioned marsh front home with private picturesque views of the Chechessee River. Launch your kayak from this .70 acre homesite! This Classic Lowcountry style home's exterior offers a unique transformation, from entry, into a fabulous casual open floor plan combining great flow between the Great Room and Gourmet Kitchen area. Walls of windows to enjoy the unique Tidal Salt Marsh/River views. Soaring ceilings,hardwood floors and Kitchen appliances that include Five Star Gas Range, pot filler, Granite Countertops, Icemaker and Wine Cooler. Newly painted interior, energy efficient foam insulation, custom built-ins, roof age 2016. The elegance of southern living & contemporary design are epitomized in this amazing property! Waterfront home situated between stately pines, moss laden oaks & the beauty of salt marshes. Soaring ceilings & walls of windows provide natural light throughout with unsurpassed views of the morning sunrise. Perfect for entertaining, the Kitchen boasts an oversized Island, Pantry & Wet Bar, flowing into the Breakfast Room & Great Room with Fireplace, Sound System & Built-ins. Each bedroom offers a private bath perfect for guests. Ground level includes 3+car garages & space to install an elevator. Home Warranty included. Resort-like amenities. A must see! Quintessential Lowcountry lifestyle abounds within Callawassie Island, a Certified Wildlife Habitat Private Community. This uniquely designed, beautifully maintained home, is one of a kind! Located at the end of cul de sac. Spectacular views across creeks & marsh on this .83 acre home site with 320 feet of marsh frontage. This 4 BR, 3 BA home of ~3000HSF features many imported items like the ornate cornices & crown moldings, heated marble floors, Swiss-made maple cabinets, tiled roof. Front door is carved teak. Fireplaces in family rm. & master bedm. 2 car garage w/ golf cart door. Sellers will consider a leaseback. PRICE IMPROVEMENT. Views! This secluded 1.1 acre property abuts to a natural easement providing 180-degree marsh views and 600+ feet of marsh-frontage. Natural light is captured in every room with a desirable open concept, split BR floor plan. This home boasts 10' ceilings, new quartz countertops and new flooring in 2016. The Master Suite has panoramic views of the marsh, a flex room & oversized closet. 3 BR with add. home office, 2.5 BA. Gas range & fireplace. Home can be expanded approx. 660 sq ft. w/ stairway above garage. Enjoy the scenic views and wildlife from your screened porch, open-air deck, or launch a kayak right from your yard! Custom built home on a fabulous lot with long golf, marsh and a distant river view! Owner suite on the main living level as well as a large gourmet kitchen open to the family room. Cooktop has grill insert and downdraft; prep sink; cherry cabinets; some pull outs; walk in pantry, surround sound, 2 gas fireplaces, wrap around deck, separate grilling deck with gas line and much more! The bar counter features a sink and wine cooler. Handicap accessible to the main living level. Loft and 2 guest bedrooms as well as deck and a fireplace on 2nd level. Walk in floored attic storage. PLUS a guest suite over garage with full bath! This home is a must see! Located on #2 Magnolia Golf Course yet recessed from errant golf balls in a beautifully landscaped back yard. The private, spacious master bedroom wing has 2 walk-in closets, a steam shower, double sinks & walk-in tub. It also features large windows & a glass door exits to a lovely screened porch with a built-in grill. The high quality appliances include a 2-draw dishwasher & a wine cooler. There is a large carpeted bonus room with full bathroom & a small room suitable for craft work. The 2-car garage & cart bay have epoxy-finished floor with built-in cabinets, shelving & work area with sink. Incredible opportunity to enjoy this uniquely built custom home offered well below similar homes within Callawassie Island. The southern rear exposure provides an abundance of wonderful sunshine covering the main living areas. Privately setback from the road within natural oaks and mature landscaping. Great Room, 1st floor Master Suite, luxurious Bath, Foyer, Great Room, Study, Dining Room, Kitchen, Breakfast Room, Laundry & Office Loft. Oversized Bonus Room w/bath offers a 4th Bedroom or office/hobby room option. Custom details include window seats, coffered ceiling, wainscoting, elm plank flooring, built-ins, & numerous walk-in closets. Start enjoying your own island oasis, this home welcomes you with a cathedral ceiling great room offering a sweeping view of the golf course and gardens through an expansive wall of windows. This move-in ready home features an open concept design ready for entertaining your family or friends. The kitchen highlights premium Jurassic granite while introducing all new GE Monogram stainless-steel appliances. The first-floor features stunning acacia wood flooring flowing throughout the living spaces, including a luxurious master suite and recently enhanced bathroom. SCHEDULE YOUR SHOWING TODAY! Developed by Smith | SG Raptor Series | Charles Sampson | CharterOne Realty - Copyright © 2016 All rights Reserved.